Waiving the Mortgage Contingency Clause- Should Purchasers in New York Take the Risk? Sellers of real estate in New York perceive the current market as one with a tight inventory for desirable properties. In such a market, multiple offers may be available to a seller. In order to select one offer over another, a seller may demand that the buyer who intends to obtain a mortgage waive the standard mortgage contingency clause in the proposed contract. This post will discuss whether waiving the mortgage contingency is a risk that a buyer should take. In a typical New York real estate contract, various contingencies (conditions) need to be met between signing the contract and closing. Some of the conditions usually include proof of clear title, a satisfactory appraisal , approval of the finances of the cooperative building and the like. If the conditions are not met, the downpayment will be delivered to the seller or the buyer, depending on the circumstances. A mortgage contingency clause works as follows. 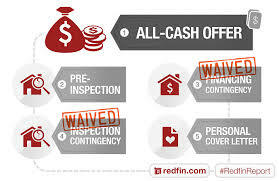 After the contract is signed, the buyer is afforded a particular number of days to obtain their loan approval. If the buyer does not obtain the loan, he can show that the loan was declined and request the refund of the downpayment. During this period of time, the seller is required to remove the property from the market and is relying upon this particular buyer to close. If the buyer has a valid legal right to cancel the contract and receive the return of his downpayment, the seller has lost potentially two months in being able to market the property again. In New York, missing an opportunity to market the property during the Spring and Summer seasons could cause the property to be overlooked by buyers until the following Spring, because most contracts are signed in the Spring and Summer months. Many sellers with multiple offers believe that it is a sacrifice to count on any particular buyer and that the buyer should take the risk of losing his downpayment if he cannot obtain a mortgage. If a buyer loves a particular house and has sufficient financial assets, he may want to consider taking this risk. Buyers are better suited to take this risk if they have obtained loan pre-approval (or perhaps pre-underwriting) before making the offer, in addition to having strong credit. Following are examples of how waiving the mortgage contingency plays out. Let’s consider a buyer with very strong credit and employment history with substantial investments in reserve. He may be confident that he will obtain a loan and be willing to waive the mortgage contingency. Even with this individual, he may lose his job or there could be a consolidation within his business that a lender considers to be a new job. If he does not obtain the loan, he may have to use his investment reserves to close, rather than lose his downpayment. Should he be willing to liquidate assets that he did not otherwise wish to liquidate, such a risk may be appropriate for this individual. There is also the case of a young couple, both of whom are employed, who have been asked to waive the mortgage contingency. Without substantial investment reserves, they may have to rely upon financial assistance from their family if they cannot obtain a loan. This couple needs to have a frank discussion with the family members to confirm that they will come through for them if they cannot obtain a loan. If the couple is comfortable with this situation, they should take the risk of waiving the mortgage contingency. Another example to be considered is a self-employed professional who has been asked to waive the mortgage contingency. Lenders review self-employed income and financial data more strictly than those employed by third parties. For this category of borrower, it is more difficult to predict whether the loan commitment will be issued. In such a case, we would not recommend that this type of buyer gamble by waiving the mortgage contingency clause. When the seller is the builder of the home, there may be a higher expectation that the buyer will need to waive the mortgage contingency clause. In this case, the builder may be including custom selections of the buyer in the finished product and is concerned that another buyer may not appreciate the selections made by this buyer if the deal dies. In some cases, builders provide contacts to their preferred lenders that are more likely to approve buyers in their developments. If this is the case with your builder, waiving the mortgage contingency may be a risk worth undertaking. There is no absolute right way to handle this issue, as it often depends on the finances and comfort with risk that any particular buyer has. Our real estate attorneys routinely discuss mortgage contingency waivers with our clients and are prepared to offer appropriate advice.